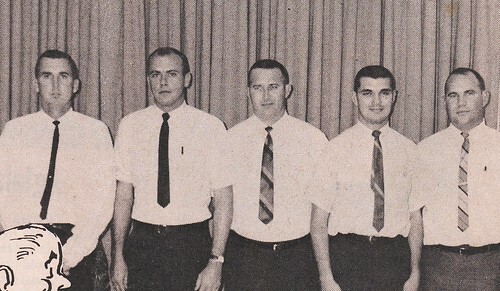 Alvin basketball coaches, 1967. That's my dad on the right. (I don't think he had any particular expertise in basketball, that's just what they assigned them to between football season and track season.) That lineup of white guys in nearly-identical outfits with nearly-identical haircuts just says '60s to me. The random pen-and-ink head at the bottom left was some sort of basketball graphic, I believe. Paula and me - I'm guessing from the little spring outfits that this might be around Easter 1962 or 1963. I look very uncharacteristically solemn, and Paula looks like she's about to cry. 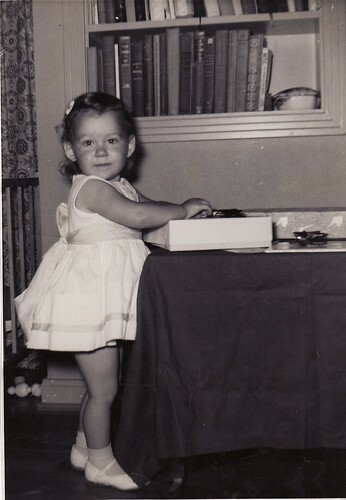 Birthday girl. I guess around the same period - my hair looks about the same! 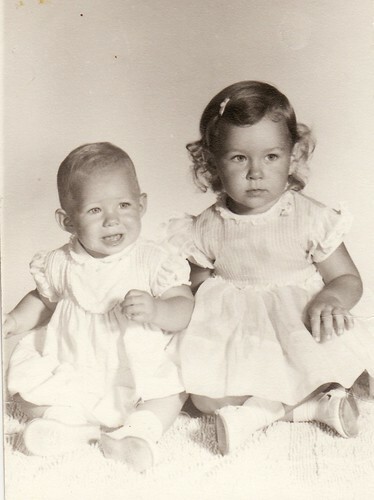 Gosh, I can see the today-you in the photo with your sister (I'm thinking of the shoot-yourself photo meme). My wife is like that, too. You can look at a baby picture of her and see her sweet face poking out.